Every time I’ve brought up wanting Crocs, I’m met with confused responses. It’s hard to argue that Crocs are anywhere near visually appealing. But it’s also hard to argue how in ugly shoes are. Especially Crocs — thanks Christopher Kane and Balenciaga! I hate trends, but when the trend costs $29.99, can be purchased at the hardware store, and elicits rude remarks from “friends,” I’m all in. 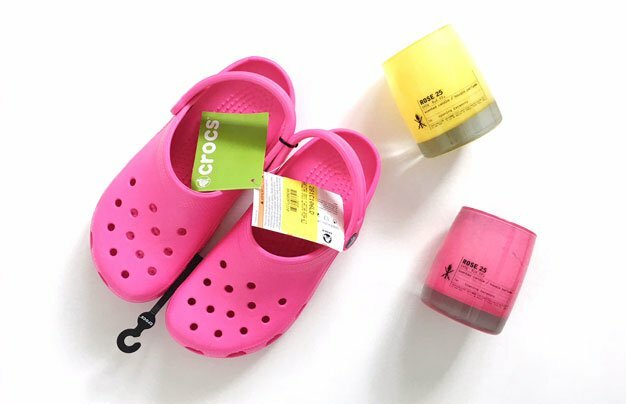 I’m so all in that I’m not even copping out with a pair of black, navy blue, or white Crocs… I’m going all in with a pair of BRIGHT fuchsia Crocs. I might hate trends, but I love a good challenge. All the shoes that I buy blend seamlessly into my wardrobe, like my Chanel slingbacks or Repetto Camilles. However, Crocs do NOT go with everything. You need a skinny or bootcut jean to give yourself more length and streamline your silhouette. If your ankles can show, that’s great too. Flared jeans don’t work well because the bell bottom hides the Croc too much. You want more volume up top (or you’ll want your hair to be more sleek, but big!) because these shoes are so clunky. Since my Crocs are incredibly loud that means that they look best when the outfit is more monochrome or simple. I all ready dress relatively simply and monochromatically, so this isn’t a huge stretch. Focus: The high hair with the midi-length dresses adds more vertical space to your outfit. It also helps to negate the slouchy feel of the Crocs. Focus: Jeans and a t-shirt never fails… even with Crocs! If you keep the outfit simple, you are more likely to make it work. While I think that I managed to make Crocs look (relatively) cool and wearable, what do you think? Are you into it? Or do you think this article is just a croc(k) of 💩? Let me know in the comments, I’m dying to know!